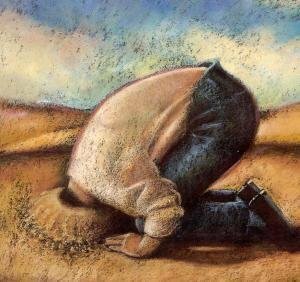 When it comes to some of the more unpleasant messages in the Bible, like those that pertain to God’s wrath, discipline, and judgment, there are far too many Christian believers who choose to bury their heads in the sand—they choose to pretend that God’s personality doesn’t have unappealing characteristics. The one thing that exacerbates these believers’ head-in-the-sand situation the most, other than the fact that these believers do not study the Word of God for themselves, is the fact that their so-called spiritual leaders refuse to preach on or teach them about any of these more unpleasant Bible messages. For sure, too many of the 21st century’s spiritual leaders are only preaching and teaching feel good, all inclusive messages! However, at such a time as the one in which we now live, where too many “churches” are full of members who, by what they value and how they live, demonstrate just how unchristian they really are, it is ever so clear that most of today’s believers are shirking their Christian responsibilities, especially where the Great Commission is concerned. For this reason, it is unconscionable, above all for believers, to refuse to recognize or deal with the not-so-nice fact that God indeed will hold every believer accountable not only for not noticing how other churchgoers have drifted away from God but also for not doing something about it. More important, God also will hold every believer accountable for not taking the Gospel to the lost world. Without a doubt, there will be a price many believers eventually will pay for refusing to recognize and deal with the fact that, because too many of them have been so self-absorbed with their own little “world” they have failed tremendously to see the lost world that is all around them. This failure of theirs unfortunately means that they also have failed to make any real effort to share the Gospel of Christ with the lost world, and they have failed to hold those in their faith communities accountable for their own ungodly behaviors. Now there are many ways “church” members can show, by what they value and how they live, just how unchristian they really are today. Some of the most egregious ways include, but are not limited to, “church” members not attempting to lead any lost souls to Christ, “church” members not celebrating when a strayed sheep or a prodigal child comes back to Christ, “church” members not going into the far away places of this world to reach lost souls for Christ, and “church” members not using their time and spiritual gifts for the making of disciples. There is scriptural proof of the mentioned egregious ways contemporary believers have become unchristian in their living. First, there is John 4:35. In this verse, by contrasting the natural harvest-time with the spiritual harvest time, the Lord shows His disciples, then and now, why they need to understand that the time to spread the Gospel is a right-now season, meaning once a harvest season has past it cannot be restored—His disciples, then and now, will never have the opportunity to reach a harvest season’s souls (never have a chance to get back the time to minister to the same people) once that harvest season is over. That is why He tells His disciples to look to the fields that NOW are ready for harvest. However, instead of looking to the fields (current mission fields) that are ready for harvest (ripe enough for believers to lead lost souls to Christ), modern-day disciples are too busy looking at who is sitting on their “churches’” pews or looking at who is singing in their “churches’” choirs, and so forth; or too busy paying attention to their “churches’” budgets; or more concerned about the size and appearance of their “churches’” buildings! Additionally, in Luke 15:7, the Lord makes it clear that if Heaven jumps for joy when a lost sheep or a prodigal child returns back to his or her Father’s House after days, months, and/or years of being in the world, then believers also are to rejoice with Heaven and even MORE so with the ONE who, though once in danger of losing everything he or she could receive, or has received, from Christ Jesus, has come back home and reclaimed his or her inheritance. There no doubt are more reasons to express joy over one lost sheep or prodigal child who strayed away but returned home as a genuinely repentant sheep/child of God than there are reasons to be pleased about the ninety-nine sheep who grew up from childhood in the fear of God and never strayed away from His pasture. Yet, instead of rejoicing over that lost sheep or a prodigal child, contemporary believers are more joyous when the already saved sheep change pastures—leave a particular local “church” so that they can join another one within the same city, town, or village! Then too, in Luke 14:23 (cf. Matthew 22:9), God (the King) clearly commands His servants, then and now, to reach out to the poor, the ordinary, the homeless, the lame, the sick, the criticized, the neglected, and so on, who live in far away areas (and/or on the many roads that lead to destruction) and compel them (persuade them with the most earnest pleas) to come to God’s House. However, instead of doing what the Lord tells 21st-century believers to do, which is to go and compel the lost to come to Christ, these contemporary believers just stay in their own “churches,” sitting on their own “blessed assurances” and nursing their so-called “close fellowships” that they think they already have with their fellow “church” members. Lastly, in Matthew 28:19 (cf. Mark 16:15), by way of the Great Commission, the Lord commands His disciples, then and now, to go into the world and share the Gospel with the masses of lost souls so that they then can make disciples of “…all nations….” In essence, they first are to evangelize, and then, secondly, they are to disciple those who have accepting Christ Jesus as Lord and Savior. Along with sharing the Gospel (preaching the unadulterated Word of God) to unbelievers, Christians also are to live the kind of lifestyle Christ Jesus lived, and they are to display the kind of character their Lord had—they are to be a witness for Jesus the Christ. However, instead of using the once or twice a week worship services for making disciples (edifying, exhorting, and empowering believers), today’s Christians just focus on preparing weekly or biweekly “church” programs that specifically are meant to draw a crowd! In short, the institutional (organizational) “church” is all about numbers, regardless if every person who attends each service is saved or not, rather than about reaching lost souls for Christ! The bottom line is that most modern-day believers not only are disobedient children who are unwilling to keep the Lord’s commands associated with the Great Commission, but also these believers are really not even trying to reverence (fear) God, primarily because they refuse to believe that He is a God of anger, a God who chastises, and a God who adjudicates, as well as a God of love. As a result, these believers are lackadaisical about AND irresponsible with their Christian duties. Put differently, they are not influencing the world around them—they neither are responding like the “salt” (a preservative) nor the “light” (a guide) that Christ Jesus says they are to be. Instead, they are Christians who have buried their heads in the sand, simply because they have committed the fundamental error of misunderstanding their calling. Once again, for the record, their calling is EVERY believer’s calling: They are to minister (serve the Lord and others) by evangelizing (preaching), making disciples, and teaching the Gospel (Word of God)! Indeed, no Christian man and no Christian woman is an island, for we are our brothers and sisters’ keeper. For this reason, no Christian man and no Christian woman can afford to be blind on purpose—no Christian man and no Christian woman can afford to bury his or her head in the sand. Instead, he or she must make every effort to truly hear and fully comprehend the Lord’s calling and His mandated duties and responsibilities, which concern how each one of us cares and looks out for one another. The main thing is that each one of us ultimately is responsible for how well we react to and interact with one another.